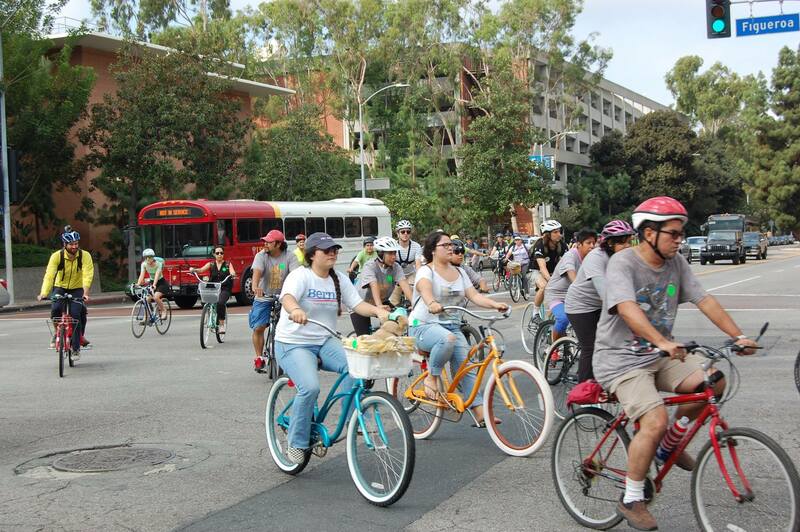 Come take a ride with us on the new Figueroa! You are cordially invited to join BikeSafeUSC, Metro, Department of City Planning, LADOT, and other community members for a free group bike ride along the MyFigueroa Corridor! On October 20th, 2018, we'll meet at McCarthy Way Metro Bike Share Station to discuss how best to use the innovative features found along the MyFigueroa corridor. No bike? No problem! We'll have Metro Bike Share staff on-hand to get you ready to ride, with a free rental and helmet, if needed. BikeSafeUSC Cycling Instructors to help make sure people of any skill level can learn to ride safely and comfortably. We'll also have some giveaways including a MyFigueroa Commemorative Tap Card, free bike lights, and more. After the ride, we'll stop for a snack at a local cafe/restaurant to discuss the benefits and potential of the new bikeway on Figueroa. This will be a good opportunity to learn about bike safety and complete street projects in Los Angeles, like the MyFigueroa project. These types of projects connect communities and offer a more user-friendly experience for people who want to walk, bike, take transit, or drive. Learn how to easily and safely get from USC to Downtown LA any way you wish, while enjoying your surroundings and company. Ready to join us? RSVP today! Thanks to all MyFigueroa Supporters and Collaborators! We are reminiscing about all the hard work and collaboration that went into bringing MyFig to fruition. We want to take a moment for a thorough THANK YOU to all of the partners, supporters, and collaborators who have made this project possible. 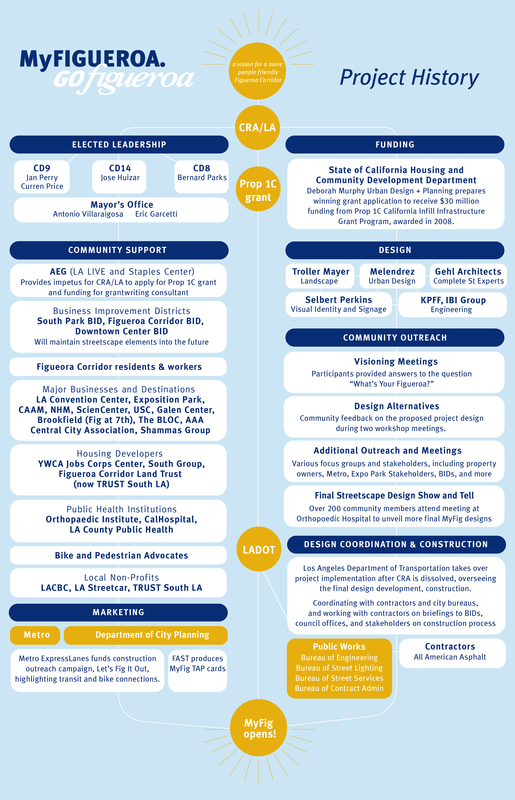 The Community Redevelopment Agency Los Angeles (CRA/LA) worked with AEG and Deborah Murphy Urban Design + Planning to apply for Proposition 1C funding from the State of California Infill Infrastructure Grant Program, for a visionary redesign of the Figueroa Corridor. This competitive grant was awarded because of their bold proposal to transform Figueroa from a car-centric thoroughfare to a multi-modal corridor serving new housing and event centers. Glendale-based Troller Mayer Associates (Rick Mayer, Greg Maher, John Massoud) led the design team for MyFigueroa, working with the LA urban planning and design firm Melendrez—now called Relm (Melani Smith, Scott Baker, Rebecca Finn). Gehl Architects (Oliver Schultze) also brought their international complete streets expertise from their home of Copenhagen. KPFF (Brian Powers) provided civil engineering to support the complete streets goals of the design team, IBI Group (Bill Delo) worked on traffic modeling and signal/striping design, Selbert Perkins (Robin Perkins) brought their expertise in branding and environmental graphics to the project. When MyFigueroa's planning began, most of the project area was in Council Districts 8 and 9, Bernard Parks and Jan Perry's districts at the time. Both of their offices were early champions of MyFigueroa, before any other complete streets projects were planned anywhere in Los Angeles. With Council District lines redrawn, a larger part of MyFigueroa now lies in Council District 14, represented by Jose Huizar. 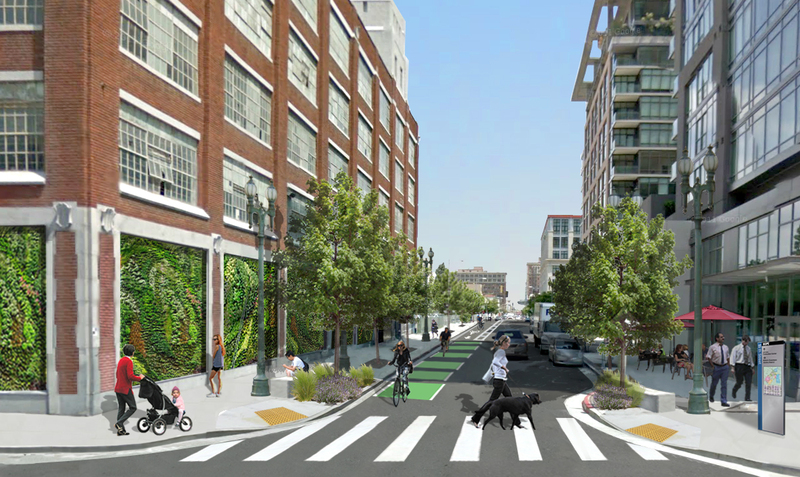 Councilmember Huizar has been a supporter of MyFigueroa since its inception, and MyFig is integrated into CD14's DTLA Forward initiative, which seeks to make streets safer and more accessible for people walking, biking, living, and working in Downtown LA. Similarly, the support for the project in Council District 9 continued when Curren D. Price Jr. was elected. His office has continued to support MyFigueroa as an opportunity for a more vibrant Figueroa Street in The New 9th. The Mayor's office has also been instrumental over the course of MyFigueroa's planning and construction. Mayor Antonio Villaraigosa oversaw bike infrastructure expansion across LA, and Mayor Eric Garcetti has continued support for MyFigueroa, as a way to improve safety for people biking and walking in Los Angeles. 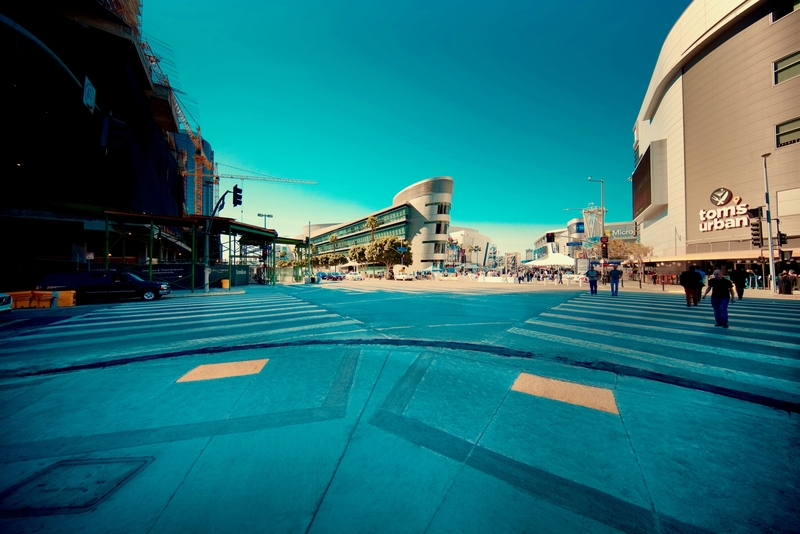 AEG: AEG, owner of Staples Center and LA Live, had a holistic vision for a more dense and vibrant Figueroa Street. They brought CRA/LA on board as the grant applicant and provided funding for Deborah Murphy Urban Design + Planning to prepare the winning grant application. BIDs: The business improvement districts in the project area—South Park BID, Figueroa Corridor BID, and Downtown Center BID—have been instrumental in garnering support from local businesses during the planning and outreach process, as well as coordinating with stakeholders throughout construction. And they will also be the stewards of MyFigueroa into the future, maintaining the landscaping and other streetscape improvements in the project area. 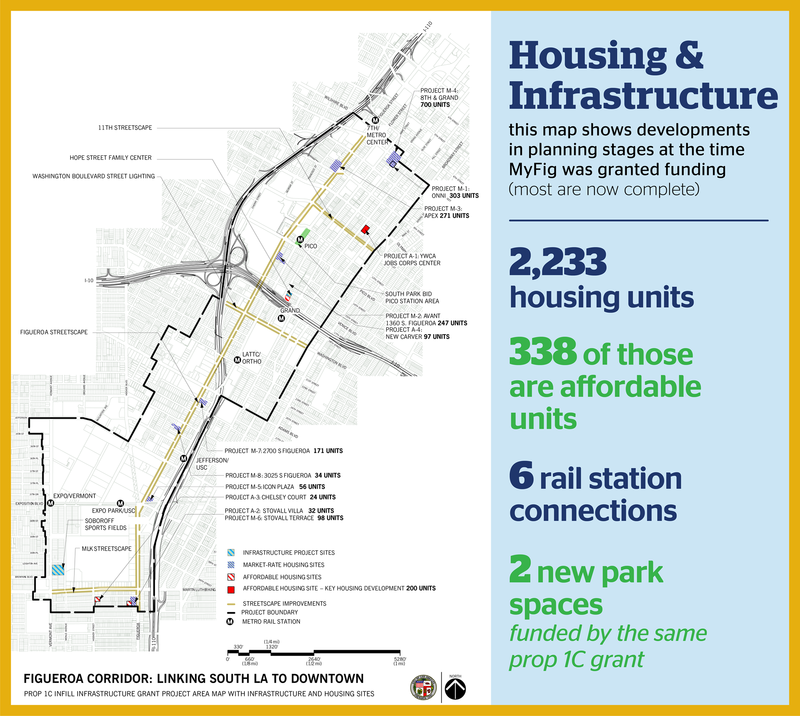 Housing Developers: The funding for MyFigueroa was awarded by the State of California, as a way to connect residents of the new affordable and market rate housing along the corridor. While MyFig was being built, so were many housing developments, including the YWCA Jobs Corps Center and South Group's Evo Building, among others. The non-profit Figueroa Corridor Land Trust (now TRUST South LA) also had a special role as both an advocate for affordable housing and bike safety in the area. Major Businesses and Destinations: Many of the other large venues along MyFigueroa have also been supporters along the way, including the Los Angeles Convention Center, Exposition Park and the museums there, as well as USC. 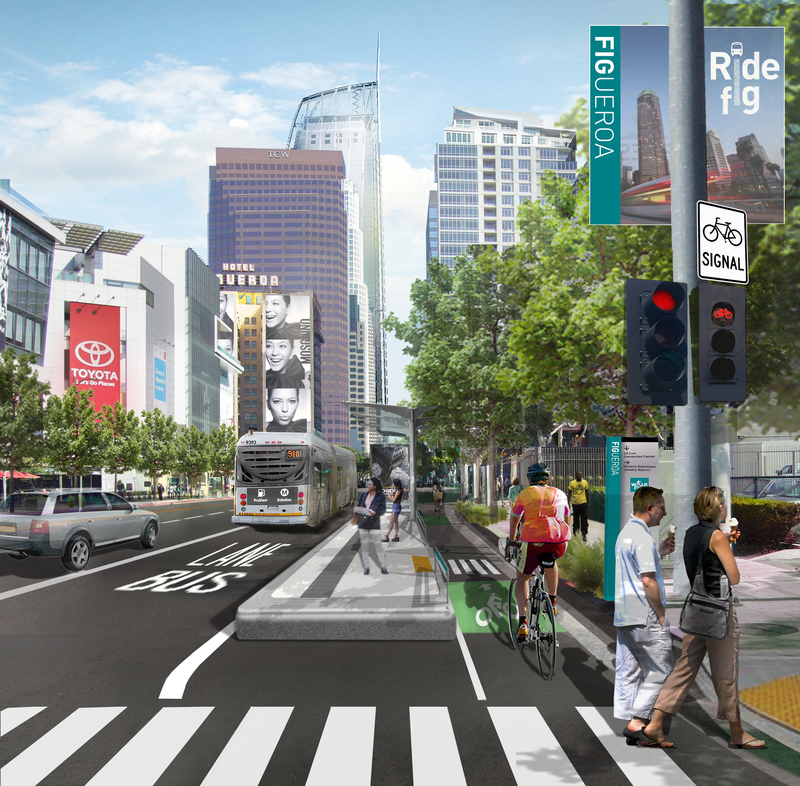 Property owners Shammas Group, as well as AAA, have embraced MyFigueroa as an important part of LA's mobility future. The Central City Association (CCA) advocated for MyFig as a tool to improve the vibrancy of the corridor. The owners of Fig&7th (Brookfield) and The BLOC (Ratkovich Company) also have supported the project and its potential to bring economic development—more foot traffic and shoppers—to the area. Bike and Pedestrian Advocates: The local advocacy organizations Los Angeles County Bicycle Coalition and Los Angeles Walks worked hard to spread the word to their followers about MyFigueroa community meetings, where LACBC also provided bike valet. Los Angeles Walks led a walk along the future MyFigueroa during the CicLAvia open streets event on Figueroa. Figueroa Corridor Residents and Workers: Above all, the people who use Figueroa everyday—walking dogs and children, commuting, shopping, running businesses, and living their lives—have been the biggest supporters of MyFig and the most patient during construction impacts. And the neighborhood councils representing residents in these areas (DLANC and NANDC). We cannot thank the community enough! The LA Department of City Planning received funding from Metro ExpressLanes for an outreach campaign called Let's Fig It Out! to inform residents and commuters on the corridor that MyFigueora was coming and to try biking, walking, and transit in the area. This campaign also included a series of trainings and safety education for bicyclists at USC, and was developed by the consultants Alta Planning + Design, Place and Page, Kendall Planning + Design. As part of this campaign, the local transportation non-profit FAST worked with Metro on a custom MyFigueroa TAP card, distributed at the MyFigueroa ribbon cutting. LADOT took over the implementation of MyFigueroa when the CRA/LA was dissolved. They worked to engineer the final shovel-ready project design and coordinated with contractors All American Asphalt. They were supported by the Department of Water and Power and the Department of Public Works bureaus through utility relocation, construction inspection, and other key coordination. The Bureau of Street Services also enhanced the project through coordinated street resurfacing and repairs. Many LADOT transportation engineers kept their noses to the ground, finding solutions to all kinds of questions that arose throughout the construction process. There have been so many people and organizations who contributed to MyFigueroa along the way, many more than mentioned here. 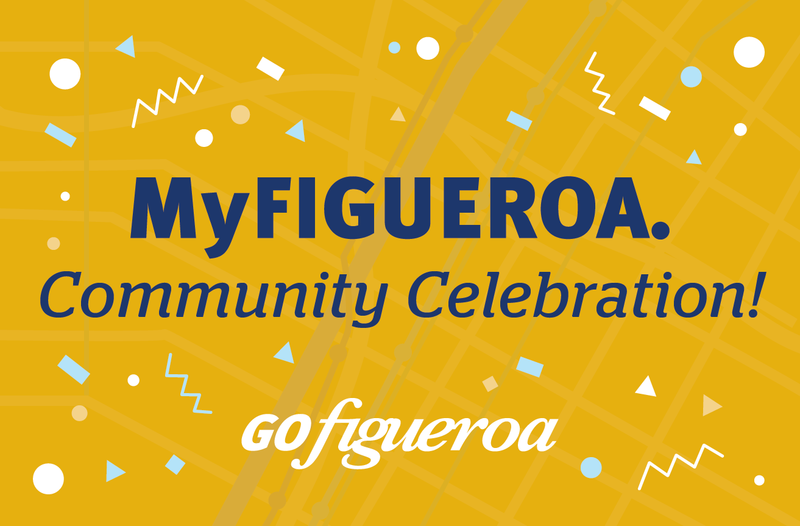 Stay tuned to our Facebook, Instagram, and Twitter, as we continue to call out all of the amazing supporters who made MyFigueroa happen! 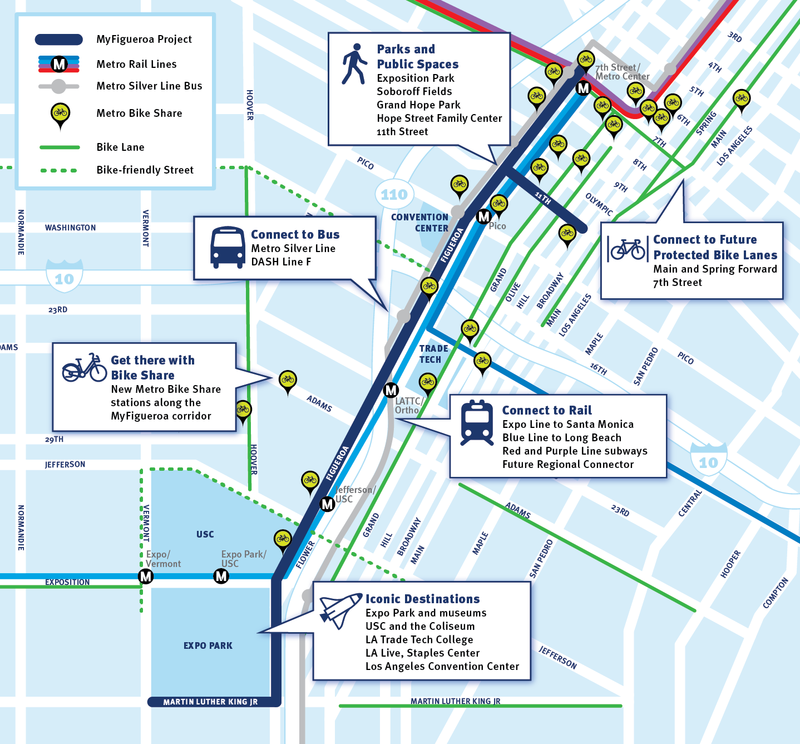 MyFigueroa is an important piece of infrastructure that is connecting many existing and planned transit options, bike facilities, and iconic destinations. As construction nears completion, we're highlighting the connections that MyFigueroa will provide within the urban fabric of Los Angeles. MyFig is the first of several protected bike lanes in the works in downtown, including parking protected lanes on Spring St and Main St ( Main and Spring Forward). On its northern end, MyFig also connects with the bike lanes running east/west on 7th St.
MyFigueroa is right in the confluence of Metro's expanding rail system. Running alongside the Metro Expo Line (which now connects downtown LA to Santa Monica), MyFig passes several Expo Line stations, including 7th Street Metro Center, where it also connects to the Blue Line to Long Beach, the Red and Purple Line subway lines, and the future Regional Connector (which will connect MyFig to Pasadena and East LA as well). The Figueroa corridor is also home to a variety of bus services, and the new MyFig bus platforms will make riding the bus on Figueroa much more efficient, since buses will no longer have to pull in and out of traffic. The Metro Silver Line runs through downtown LA on Figueroa, before taking commuters on the Metro ExpressLanes along the 110 freeway to San Pedro or along the I-10 freeway to El Monte. The Los Angeles Department of Transportation's DASH line F also runs along Figueroa, with stops every couple blocks, providing an important connection between downtown and the University of Southern California. From Exposition Park to Grand Hope Park at 9th Street, Figueroa connects a number of open spaces, including the park at Hope Street Family Center and Soboroff Sports Fields, which were funded as part of MyFigueroa's Prop 1C funding. The corridor is home to several outdoor shopping areas as well (such as 7th at Fig and The Bloc). 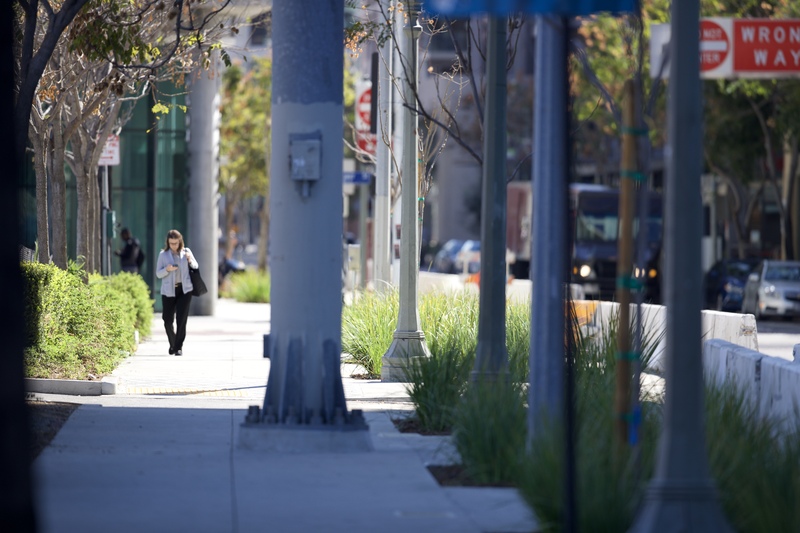 And most significantly, MyFigueroa has brought wider sidewalks and landscaping to 11th Street in South Park, turning the street into a five-block linear green space. MyFigueroa passes some of the most iconic LA destinations. Basketball fans and concert goers will now be able to bike or bus on MyFig to get to Staples Center or LA Live. USC students will now have an easy and safer route to bike from campus to restaurants in downtown or museums in Expo Park. And LA Convention Center visitors will also be able to use MyFigueroa to see more of what Los Angeles has to offer, throughout downtown and beyond. On top of all of that, Metro Bike Share is expanding south along Figueroa, providing more options for people traveling on Fig. Now you can ride transit to work or school in the morning and hop on a bike share bike on the way home, connecting with the existing network of bike share stations throughout downtown LA. All of these layers make MyFigueroa a vibrant corridor where people work, live, ride, shop, play, and run into friends on their way. The complexities of combining buses, light rail, bikeways, and event centers like stadiums and museums make it a place unlike any other in Los Angeles. LADOT has been working to balance the efficiency for all of MyFig's uses, while keeping in mind that it's not a major thoroughfare for those just passing through, but home to many destinations and a destination in itself. 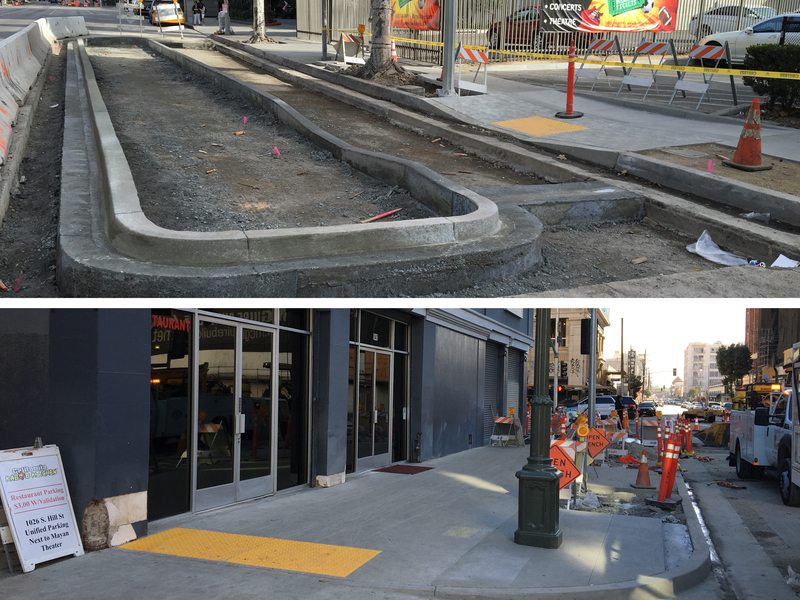 New Landscaping on 11th Street and More! 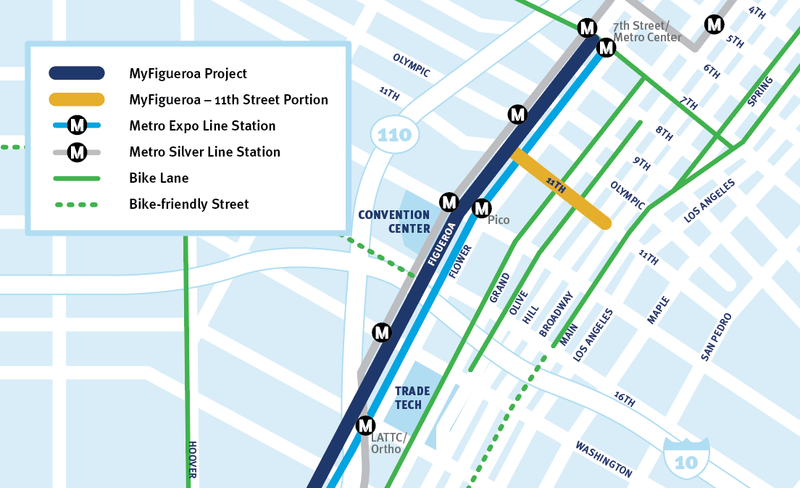 MyFigueroa construction wraps up on the north side of 11th Street this month. The newly installed landscaping looks great and complements the completed new sidewalks and pedestrian ramps, making the street more beautiful, safer, and accessible for everyone. Soon, construction will shift to the south side of 11th St, as we continue toward project completion in late spring. On Figueroa St, construction is about to begin on the final four bus platforms on the west side of the street, between Adams Blvd and Exposition Blvd. 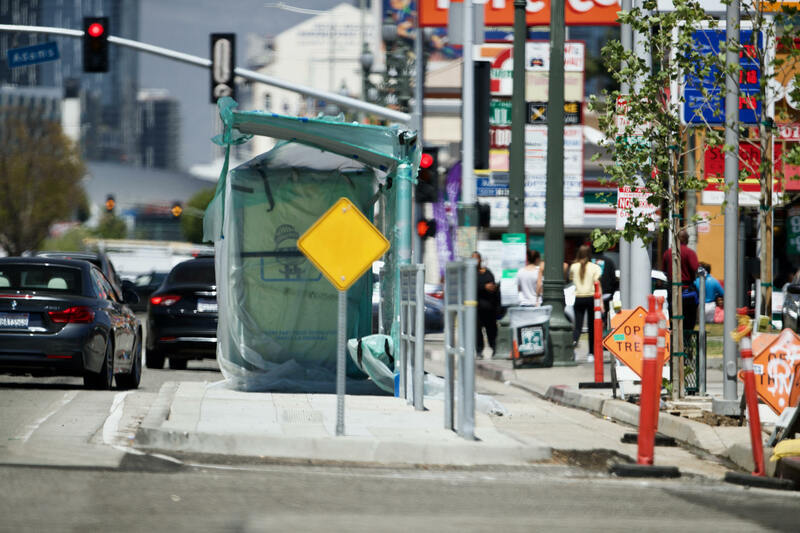 On the east side of Figueroa, look out for bus shelters, which will be installed soon. The construction teams are also planting trees all along MyFig in the next few weeks, making way for a more walkable and vibrant Figueroa! Project completion is anticipated at the end of Spring 2018. Stay tuned for our announcement of a ribbon cutting ceremony coming at the end of spring—we hope you'll join us! 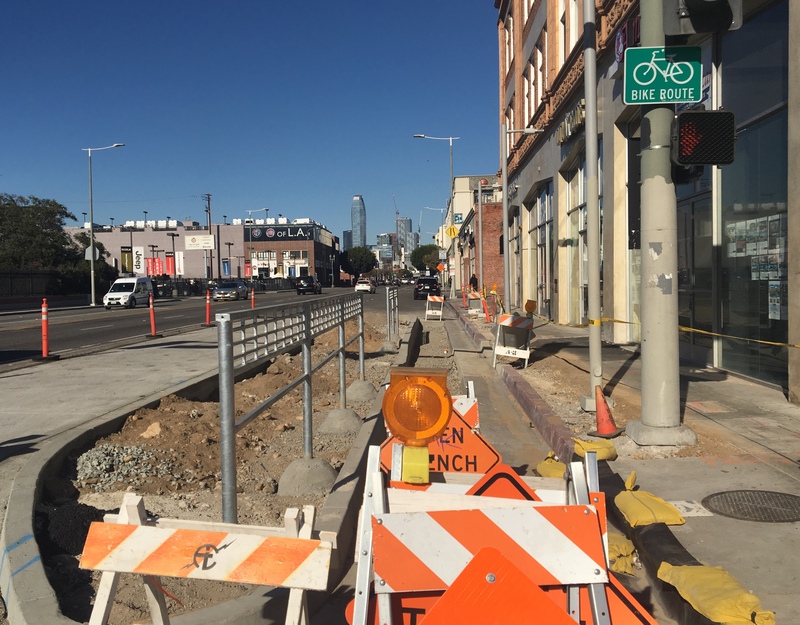 If you live or work in the MyFigueroa area, you've likely noticed that construction is well underway on 11th Street. 11th Street is closed to one lane from Los Angeles Street to Figueroa to allow for construction in the roadway and on the northern sidewalk. 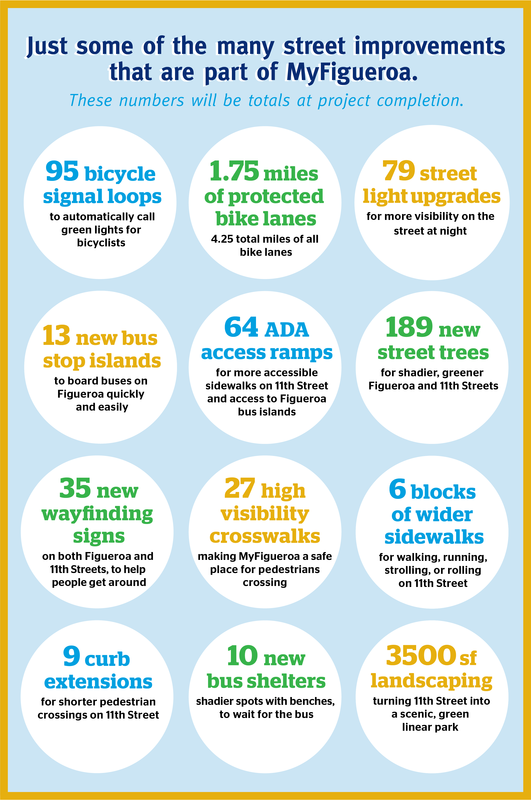 Please bear with us while we work to make 11th St better for everyone walking, biking, and driving there! Construction will begin on Figueroa itself very soon. 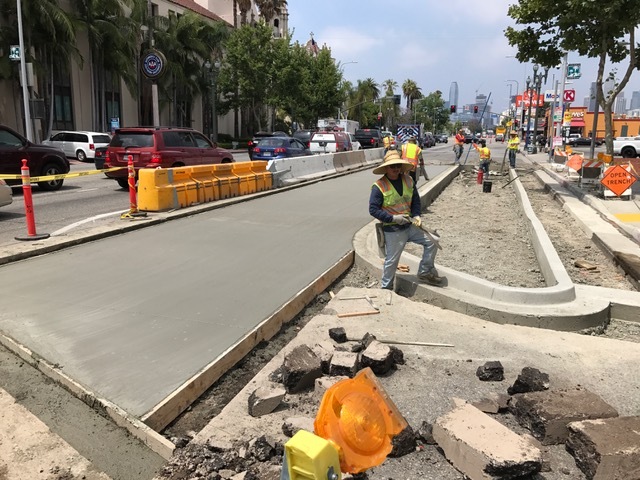 LADOT and the contractors are still finalizing traffic control plans, to ensure traffic can continue to flow as smoothly as possible during the construction of the new bus platforms. 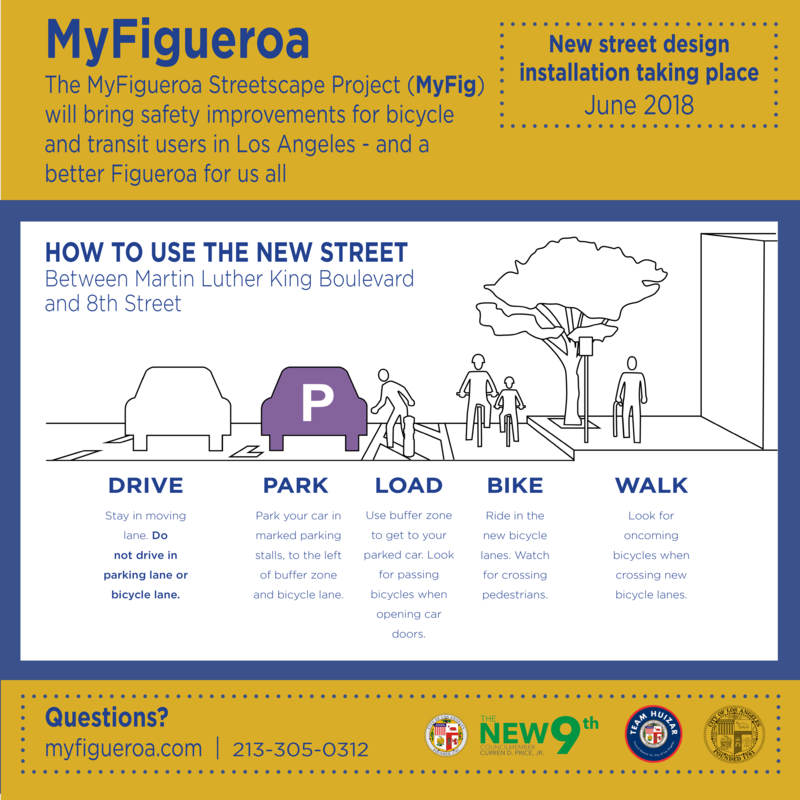 Please continue to share these details with others in the area and let them know that MyFigueroa will bring a better, safer, and more beautiful Figueroa Street to the neighborhood soon. You can also download and share our construction notice here! 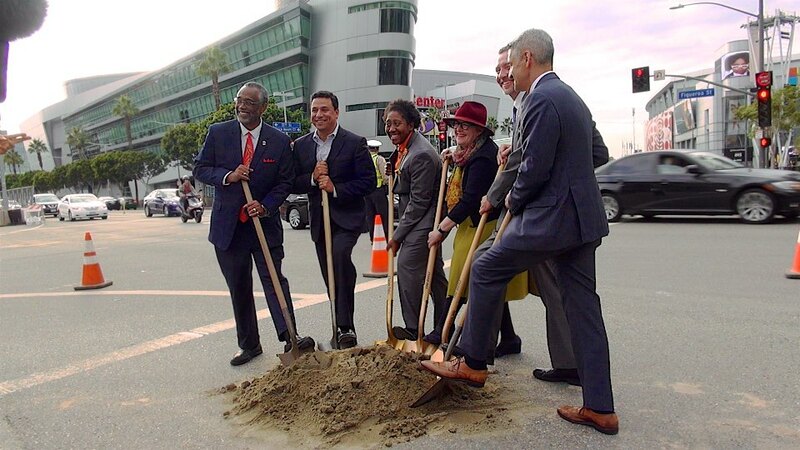 Left to right: CD 9 and CD 14 Councilmembers Curren Price, Jr., and Jose Huizar, along with Tamika Butler, LA County Bicycle Coalition Executive Director, Deborah Murphy, Deborah Murphy Urban Design + Planning, Dan Mitchell, LADOT Assistant General Manager and Vince Bertoni, Director of City Planning commemorate the MyFig start of construction with a groundbreaking at 11th St. and Fig St.
More information about the project can be found at MyFig Press Release 10-24-16. Bike Month is here, and it's time to think about what it will be like to bike on MyFigueroa, Downtown LA's first protected bike lane. Stay tuned for updates on MyFig construction, and in the meantime, Let's Fig Out different ways to get around Figueroa outside of our cars. FIg Out a Bike Route: This Thursday May 19 is Bike to Work Day. If you're biking near Fig, stop at LACBC's South LA Pit Stop at MLK Blvd and Vermont (the southeastern edge of the MyFigueroa project). Fig Out Expo: This Friday, May 20 is Metro's Expo Line Phase 2 grand opening. For the first time in 60 years, Angelenos will be able to ride a train from Downtown LA to the beach in Santa Monica! Hop on the Metro Expo Line Downtown or near USC, where it runs just one block east of the MyFigueroa project. 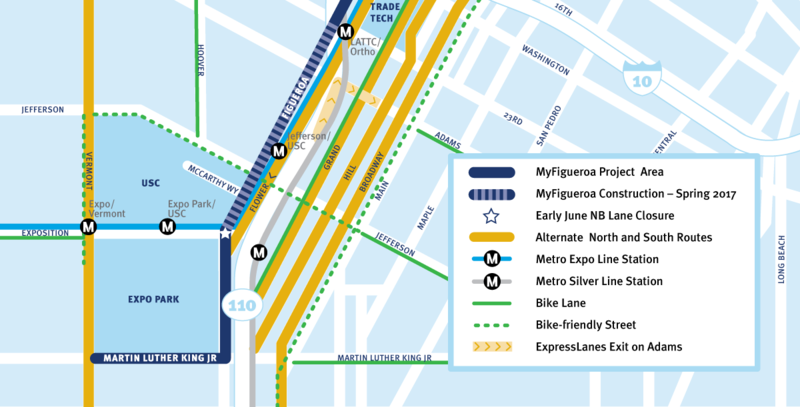 See how MyFigueroa will connect with Metro to give Angelenos more options for getting around. Biking on Fig from USC to CicLAvia, we explored downtown on bike and learned about the MyFigueroa project coming soon!